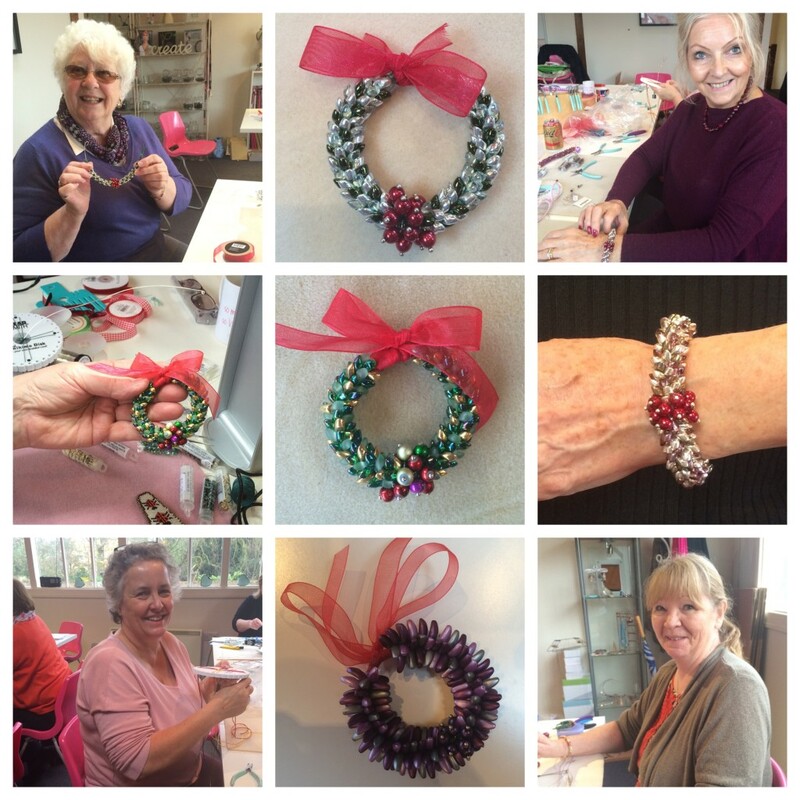 Yesterday my Kumhimo Christmas Decoration workshop was hosted by Spoilt Rotten Beads and a very enthusiastic group of ladies worked hard to produce these beautiful ornaments. Didn’t they do well! I had prepared two projects for the workshop, a wreath and a candy cane. I decided to start with the wreath because it was the longer project and involved a fair amount of bead threading. Long Magatatma beads need to be threaded accurately and in some colours the orientation of the hole can be difficult to identify. I wanted people to be fresh for this, so that mistakes and frustration could be minimised. I also believed that this would be the more popular project and doing it first would give people the option of making a second wreath instead of the candy cane. 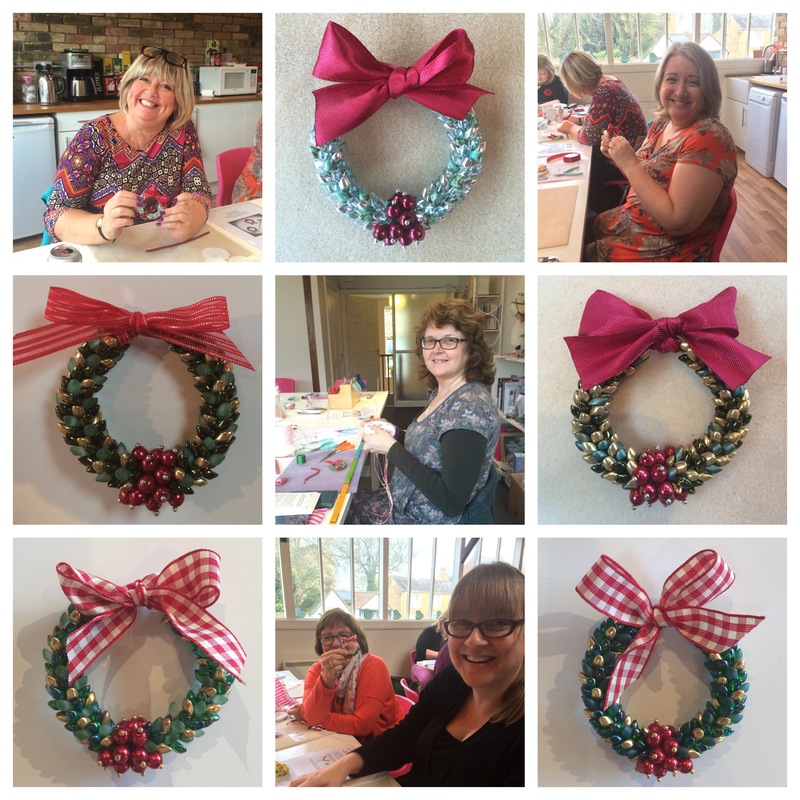 All the participants were ‘repeat offenders’, in that they had been to one of my previous workshops, so we were able to progress at quite a fast pace and by lunch time a lot had been achieved and many wreaths were nearly finished. One of the lovely aspects of workshops from the tutor’s point of view is the variety of colour choices and even bead substitutions. Some people like to stick closely to the colours used in my examples, some like to add a few touches of their own and others like to try something completely different. All the variety makes for a very lively and interesting workshop for both pupils and teacher and I hope that we all come away wanting to try different variations. Those who chose to stick to the traditional green wreath effect could make the design their own by varying the tones and finishes of green bead. By opting for turquoise or purple a more contemporary effect was achieved. Manda decided to try a completely different shape of bead, which worked brilliantly and Georgie decided to make hers into a bracelet. A couple of people thought they would like to use theirs as a brooch, rather than a tree decoration. For me as a tutor, this is exactly what I want to achieve. My aim is to open up the potential of a design and it is the creative input from all the participants in a workshop which makes this possible. In the afternoon some fabulous candy canes were made, but sadly I forgot to take photos of them all. People tried different colour combinationas and cord sizes to customise the original design. Not everyone wanted to make the candy cane at the workshop, but they went home with full instructions in the handout and they had learned the key technique in the morning, so they would be able to try it at home if they wanted to. Instead they worked on bracelets or additional wreaths in different colours. As you can see from the photos, people seem to have had a lovely time and I certainly did. However, now my challenge is to come up with something equally popular for next year!